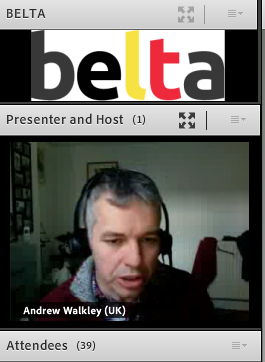 This afternoon, I have had the pleasure of attending a fantastic webinar presented by Andrew Walkley, one half of the popular Dellar-Walkley duo whose project Lexical Lab you might be aware of. Andrew delivering an awesome webinar! First we were asked to put groups of four words into order of their frequency. Then we were asked to make examples for a set of seven words and a structure (the past continuous). In TBL, if there is breakdown in communication, this is where learning is supposed to happen, the teacher facilitating this learning. In Dogme, maybe some further practice together will be done too. With Demand High teaching (which concept he said sparked this talk), there was a complaint that a lot of teaching taking place where you move from task to task but without much actual teaching happening. The teacher needed to be stronger in saying ‘no, this is wrong’ or pushing individual students and teaching them in the moments where they are struggling. A lot of Scrivener’s solutions were technical, technique-type things, e.g. the teacher pretends not to understand what the student is saying, thereby forcing them to explain why what they were were saying was right. That’s ok to a point, but Andrew felt that it wasn’t the real reason why the teaching wasn’t happening. He has been interested in the Lexical Approach since its publication 20 years ago now, he has also been aware of the expectations of thinking about language and dealing with language that are advocated in LA are high. He recognises that it is difficult. Andrew then introduced us to a book, Thinking Fast and Slow by Daniel Kahneman. It deals with the difficulty for experts in employing their expertise. This is because of the need for fast, in the moment, spontaneous thinking, where rather than think clearly about certain aspects of thinking, we replace a kind of logical thought with heuristics i.e. a generalised idea of something. This brought us back to the task we did at the start. Then he asked whether the corpus frequency answer (biased towards written) is reflective of the bias in native speaker natural use? His feeling is that often we overestimate certain frequencies of words and underestimate others. In the spoken corpus, arise and beard come at a similar level. Many students are interested in academic and professional lives in English, where they may not be using the language all the time in the workplace or study in Britain etc, but the resources they use may be in English, so a word like ‘arise’ would have a higher frequency and value. Apparently words also have a representational bias, e.g. x is y, x does y, doctor has a white coat etc. So the examples and explanations that come to mind are often of that nature. Finally, priming: In English language teaching, this is quite strong. E.g. I was having a bath when the phone rang. 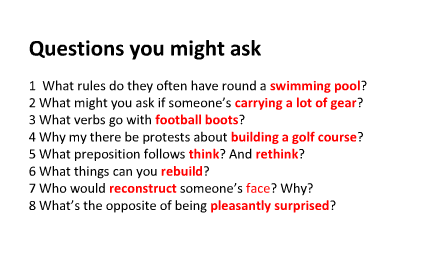 Because of what we’ve learnt before and what we’ve seen in coursebooks before, we think of certain examples and contexts, and we don’t see the wider context we could use. Sometimes when we are trying to hear what students are saying, and trying to correct them, often what we are primed to notice is basic grammar, typical grammar that we have taught before. So, we will commonly notice the present perfect used incorrectly or missed third person ‘s’ and these we look to correct. Andrew explained that this is problematic in terms of these responsive methodologies. There is too big a cognitive load for any teacher trying to use these methods. You have to hear the student first, which is already difficult possibility due to layout and noise levels. You then have to explain or check why one is correct and the other isn’t, if we are talking in terms of TBL and Dogme, then extra examples of new language are necessary, and for Dogme also further ‘spontaneous’ practice. Finally you need to remember it in order to revise and recycle it at a later date. That’s a lot to expect. And multiplied by all individual students with individual needs. So, instead, Andrew said, we fall back on examples given before, or focus on relatively infrequent words and give simplified examples which don’t necessarily reflect enough of how those words are used. Yet if you are a believer in a more lexical approach to teaching, one of the most important things is giving good examples of how language is used. So, this is the big issue with these methodologies. Ironically, often, somebody who doesn’t like coursebooks will give examples that have been seen in one before! Coursebook writers are similarly primed. You come up with examples which afterwards you think ‘what was I thinking? Nobody would ever say that!‘. If you believe that exemplifying natural use is important than you need to also think outside the class. Inside the class it is too difficult due to cognitive load. It may also be that to become a better non-course book user, we need to become better coursebook users and writers! The more we focus on different words and how we might exemplify them and ask questions about them, and think about spontaneous practices for them, the more we will get better at doing it spontaneously. Kahen (of the above-mentioned book) suggests the example of chess players who basically learn lots and lots and lots of moves. It takes all those hours of practice in order to become spontaneous in the context of a chess match. We may not have so much time to prepare in our lives but it’s an ongoing process so if we work at it incrementally, we’ll get better at it. In terms of the planning, on training courses and post-qualification, planning focuses on activities: thinking of activities to help practice bits of grammar or vocabulary in the course book. Whereas we should think a lot more about the lexis and the questions we are going to ask about it etc. in the planning. Judgement of lessons in observations shouldn’t based on fulfilling aims as it goes agains the idea of being responsive to students. So we need to think about how we think about language AND expectations of what a good lesson is. Teacher development tends to focus on learning new techniques. E.g. Demand High. Frustrating because it is more techniques, other ways of doing somehting. Wehreas I feel we need to focus more on actual language. Macmillan dictionary: game to decide if it is three star, two star or one star words. (Different frequencies) Once you realise that something is frequent, thinking about why it’s frequent and as a consequence thinking about the kind of examples you might give to reflect that frequency. The compleat lexical tutor: I missed this explanation! Phrasal English.org: Uses the BNC. Put in a word or two, request exact word or same lemma. E.g. inc plural, past participle form included. Gives a rough count and a concordance. (Like wordandphrase.info, I think?) May be skewed by names. E.g. Christian. But still gives an idea. You might just take this as a staffroom thing, e.g. reading something or taking a collocation. Have competitions who thinks something is more common than something else. E.g. ambitious plan vs ambitious scheme. Then find out. To help us think about frequencies. Essentially a lot of vocabulary activities focus on single words. Increasingly, now, you also get collocation exercises, matching two words to make a collocation. You might even have whole sentence exercises e.g. gap fills, little dialogues matching question and response. We need to think about slightly different ways of using these. In a single word exercise, we should think about what collocations to elicit from students about these words and questions to ask about the vocabulary. Not just meaning focused but usage focused. With collocation exercises, now we need to think beyond the collocation and think about the collocates of the collocations e.g. example sentences and dialogues, or a story to tell? And then if you think about the whole sentence exercises, ask questions to get students reuse grammar and chunks, and other vocabulary that isn’t the focus but can be exploited. The temptation is to say the non-odd words out are the same. But are they? And what do the students get apart from adding re-? Instead think about how we can use these words more. What collocations can go with these words? Is what we reconstruct the same as what we rebuild? Is what we reconsider the same as what we reexamine? E.g. we can rebuild a relationship but we don’t reconstruct or remake it. We reexamine the evidence but we don’t rethink the evidence. We might rewrite an essay but not reword it. We might reword something shorter like an answer. We remake a film but we don’t rebuild it. These are the kinds of things we want to be able to tell our students. We need precise examples. Going back to supermarkets, we might overestimate its frequency, quite often we don’t say I’m going to the supermarket, we say I’m going to Tescos or Carrefour. Perhaps these are better examples for our students in some ways. What works with these collocations e.g. swimming pool and swimming trunks. Fishing rod and fishing gear. After you have matched them up, possibly with a picture thrown in, what next? Need to know how to use them! A second question you might ask is who would you say it to, when would you say it, why would you say it? Think of how they might work in a dialogue. Sometimes the compound gets split up. E.g. see you on the track in half an hour. (Running track) Or swimming pool. Let’s go swimming. Ok see you at the pool in 15 mins. Andrew suggests that we need to spend more time thinking about this aspect of language rather than on activities, in our planning. Think about the kind of questions we ask about vocabulary. Can we generate language around target words? E.g. What might you ask if someone is carrying a lot of gear? Can I help you? Oooh where are you off to? Thinking about these kind of questions on the spot is quite difficult, you need to think about them beforehand to be able to ask them on the spot. More complex sentence examples show more of how language works, so students see more examples of grammar in use. Rather than x is y. (She is a Christian vs As a Christian, I think we should look for non-violent solutions = As a x, I think we should y. Who was the guy with the beard? I haven’t seen him before = who was the guy with…the blonde hair, sitting next to you… etc. I haven’t seen him before. Through vocabulary, we can ask simple quick questions to review grammar. E.g. When the paramedics arrived, his heart had stopped beating but they got it going again and then rushed to the hospital. –> Draw attention to the past perfect, when you get something going again, why/where else do we rush to? There are lots of these kinds of patterns we could draw attention to, that are useful and interesting little patterns that students could use but don’t make it into coursebooks. You have to have thought about the example before, but once you have thought about it in planning before, in the context of a text or language focus etc. it makes it available to use spontaneously in response to students in the future. 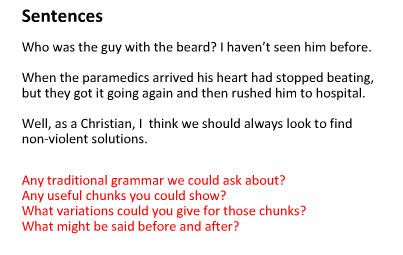 Andrew then told us about one aspect of his and Hugh Dellar’s Lexical lab: you can send in a completed exercise and Andrew/Hugh will suggest questions/chunks relating to it and invite suggestions from others too. Think about what the students might want to say in the speaking exercises you plan to set up. It may mean either doing the task yourself, or with a teacher partner, and seeing what comes up. Get teachers to record their answers. Notice the language that is repeated or could be useful for the students to do the task. Often there is a disconnect between grammar practice and single word practice and the task we set which requires a more complex use of language and may include a variety of things we haven’t thought about. Questions that Andrew recommends asking to promote development! The first two questions require genuine interaction in the classroom, where rich language can be found. The third is important as what is new? A new combination? New phrases around known words? Because often the grammar or word is known, but the language around it isn’t. The fourth encourages you to reflect on the questions you ask and improve them for next time. The last question is based on the idea that we do get better at dealing with language if we write material. Ideally do it with someone else, get someone else to look at it. This encourages you to be critical and think about language in use and how students might want to use it. Being able to answer language questions and being able to ask questions about language in this way is not a natural thing but a little bit like relearning the language and a process that needs to be ongoing along with your students. You need to practice it. 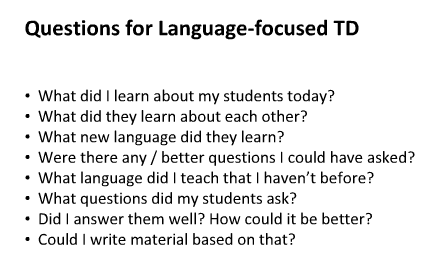 Language-focused TD is like language learning: it never stops! Thinking about the wider context of language use. We need to think beyond the obvious. Maybe students won’t use the banana example because they go to the shops themselves and don’t have anyone to ask to buy bananas for them! Whereas the words we thought less common might have more possible contexts of use and so be more common than we thought. In response to concerns that this approach may become too teacher-centred, Andrew responded: talking about language and giving examples is student centred, as it is what the students want to say and need to hear in order to be able to say them better. Teacher talk: needs to be for the students’ benefit. It is also important to use generative, slightly open questions. Students might make jokes in response to them. E.g. Why would you want to reconstruct someone’s face? Because they are plug-ugly vs. after an accident. I found this webinar absolutely fascinating. It reminds me of my last observation where I think basically my DoS was recommending that I do this. I.e. that I plan my vocabulary focus more, because of it being difficult to respond effectively on the hoof, and I think the intention was in this vein. Having watched this webinar, I now have a much clearer idea of how to go about that than I did previously. Am looking forward to implementing this and gradually developing in this area. It was my first time to see Andrew speak and I have to admit to now very much looking forward to hopefully attending his talk at IATEFL! Thank you very much, Andrew, for a really valuable hour and a bit! And thank you, BELTA, for hosting him! Things I have learnt about Quizlet from Leo Sellivan’s Webinar! IATEFL run regular webinars for English Language Teachers to participate in, fortunately for us, and this afternoon I was lucky enough to be able to spend an hour listening to Leo Selivan share his knowledge of the power of Quizlet. For those who don’t know, Quizlet is a website that enables you to create sets of flashcards, using words and/or images. I am a big fan of Quizlet, having used it for my own language learning, and have tried to help learners use it too, by creating self-access materials for them to use. Coincidentally, as the webinar started, I received notifications saying a learner of mine was adding a set to one of my Quizlet classes! Memorable and manageable is what vocabulary recording should be! – Students view it as time consuming, possibly waste of time and prefer to record vocabulary in a linear fashion rather than elaborating on existent entries. – Students’ notes and your notes not in synch. – The notebooks do not provide active recall practice (ARP is necessary to commit new vocab to long term memory): Students can see the words in front of them, so they don’t need to try and retrieve them. Whereas ARP aids memorisation process. Research shows that incidental learning of vocabulary is not enough. – We need a combination of both contextualised and decontextualised practice and use. – The Communicative Approach sees language as a tool but vocabulary experts today say that it is justified to treat vocabulary as an object of study, not just a tool for communication. NB: Leo cited Laufer B (2005) – I think the title was Focus on form in second language vocabulary learning but check his reference slide to be sure – as the source for this information. 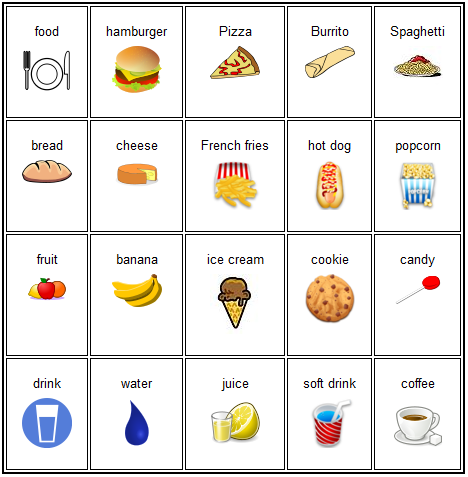 – To learn vocabulary we need frequent encounters with new items. 5-15.However vocabulary learning isn’t only increasing the size but also how well you can use the words that you know. E.g. depth as well as breadth. Depth is all about the how of the word rather than just the what. – Meaning is important but form is too. Students may think they know a word because it looks like they a word they know. E.g. adopt – adapt. This leads to over-estimation of vocabulary knowledge. – We should exploit L1. Especially in a monolingual setting. – We should provide focused engagement with new language. Opportunities to manipulate, use it in different contexts etc. When you access the website, you are presented with the functions of: Flashcards, Learn, Speller, Scatter, Space Race and Test. You can create classes. Yup. But as a free user, can only have 8. If you want more, you can create folders. It has as a mobile app, so you can practice on the go. Gapped definitions can be more useful for co-text, also more personalised as it is your example sentence. Dictionary.com not useful for learners, as definition uses more complex language than the word being defined. Use good online dictionaries e.g. Cambridge, Macmillan, Longman dictionaries. Leo’s blog has a section called essential lexical tools, well worth checking out. – define a word with its synonym: This gives the false impression that the words are interchangeable, whereas they collocate differently etc. E.g. What’s happened to you? Ok. What’s occurred to you? Not the same. – 9 different aspects of knowing a word: spoken and written form, meaning, spelling, collocation, grammatical patterns, constraints e.g. appropriate in informal or formal context, connotation etc. Textbooks tend to only pay attention to form-meaning links, neglecting other aspects. In classroom interactions, teachers also tend to focus on teaching means rather than the other aspects of word knowledge: “The tip of the lexical iceberg” as Leo put it! – The collocation of a word may result in different translations in another language: E.g. heart conditions vs terms and conditions. – Co-text is important for learning a word. NB: Context is the story or situation happening around a word whereas co-text is the words immediately surrounding the word e.g. have an accident or by accident. “The linguistic environment”. Example sentence with a blank plus definition in brackets at the bottom. And word on other side. Phrase and translation: perfectly acceptable and you can also negotiate the translation in class. Phrase in a conversation: Provide phrases within a conversation, e.g. the phrase is taken out of a dialogue. But in learn mode, all that conversation is what you have type in in learn mode, so it is difficult. Less text is easier for the learn mode. Word and collocate in co-text sentences with first letter clues. You can increase or decrease challenge in this way, e.g. by adding the last letter too, or not. In learn mode, do you have type in all those multiple dots. If learners type the answer correctly without multiple dots does that means Quizlet would reject the answer? Fortunately not! You can bold certain items! When you enter the definition, you put stars on both sides of the word or group of words that you would like to bold. So, you can highlight dependent prepositions, for example. Or bold the gapped sentence and leave the definition normal. Another tip Leo offered was to encourage students to take screen captures of their scores and times from their out of class study and compare in class! Finally, I discovered that he introduces learners to Quizlet in a similar way to me, but including his special order of use of the functions (see above) that I will be bearing in mind from now on! This was a fantastic webinar, which this post only gives the merest overview of, and I fully recommend accessing the recording on the IATEFL website if you can, or if/when Leo publishes his slides or any blog posts about it, visit his blog. Leo blogs at Leoxicon, which is well worth a visit, with plenty of quality content. Why do we need to plan how we teach lexis? 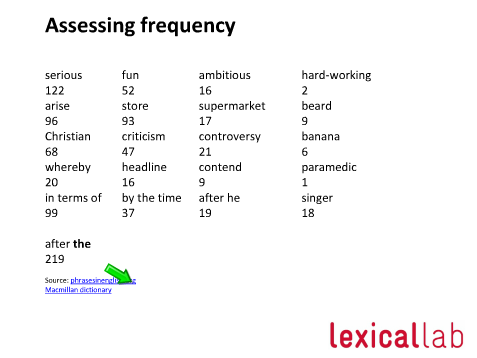 Focus on lexis is needed for learners to remember and be able to use lexis effectively. When acquiring L1, exposure – massive exposure – may suffice but in a classroom context, the exposure available is not sufficient for lexis to be acquired efficiently without focus and careful planning. “Without grammar, little can be conveyed, without vocabulary, nothing can be conveyed.” – Wilkins, 1972. How do we choose what lexis to teach? What criteria can we use for selection? We could teach learners the most frequently used words. We have frequency lists that would enable us to do this. However, there are limitations to this approach. The top 50 most frequent words are mostly grammar words e.g. “and”. Frequency can clash with “teaching convenience” e.g. days of the week have different frequencies. Words may have great interactional value but little referential value. E.g. “just” is very commonly used as a softener but has little meaning on its own. Frequency lists include single words rather than collocations whereas many collocations would feature more than individual words if lists allowed it. It raises the questions of whose frequency. British English frequency? American English frequency? Frequency in language used by pilots? Context and learner needs may mean that more specific vocabulary is required from the outset. These may be more apparent in an ESP or EAP class than in a general English class. If you are teaching in a very specific context, then this will influence your vocabulary selection more than other criteria will. There are a lot of factors that influence the learnability of a piece of lexis. Grammatical behaviour. How does it behave grammatically? E.g. accuse -> accuse somebody of doing something; suggest -> suggest that; depend -> depend on; responsible -> responsible for. L1 aid/interference: Is it a cognate or a false friend? False friends mean meaning is easily confused. Confusability: similarity of words e.g. raise (transitive) /rise (intransitive), similarity of root word e.g. take over/take after. What about language that emerges in class? Do we ignore “Dogme moments” because it is a low frequency item or an item with low coverage etc.? Or do we take advantage of learners’ desire to know something? There are many collocations that we use frequently: many would feature more than individual words if they were allowed in frequency lists. 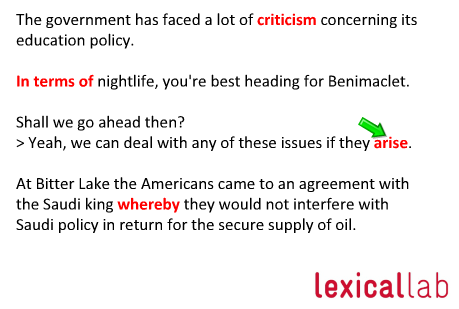 When we produce language, we go to lexis first and then use grammar to control it. Verb and adjective collocations of content nouns: e.g. teach “set the table” rather than just “table”. In order to be able to use nouns, we need to know the verb and adjective collocations that we can use them with. “See” – used more commonly to mean “understand” than for its literal meaning. – do we need to rethink our priorities? It could be better to teach learners to use what they already know in a wider range of uses. recognise – do they know it when they see it? identify – do they know it when they see it within a text? match – can they put it together with its definition? with common collocates? with synonyms? with antonyms? categorise – can they link it with the correct word type? topic? metaphorical v literal? etc. retrieve – can they remember it without a visual or aural stimulus? contextualise – can they use it in a sentence or as part of discourse? activate – can they use it without prompting? extend – can they use it in a variety of ways? manipulate – can they convert it into a different word type? can they use it in combination with other words? rank – can they compare it with other lexis? deduce – can they guess what it means when in an unfamiliar combination? This refers to the number of times the brain touches the word: identify and rank = two processes. The more processes used, the greater the depth of processing becomes. The greater the depth of processing used, the greater the chances of retention. It is important for learners to use a variety of processes when learning lexis. “Front door” teaching means identifying a group of words and teaching them. This can be done in two ways. “non-verbal” : using pictures/images (e.g. photos, from the internet, flashcards), symbols, actions (mime, gesture, facial expression), realia, drawings, sound effects. “Back door” teaching means using a text-based approach, in which you highlight/draw attention to words/chunks within a text. Elicitation is a commonly used technique in the language classroom. It is when we get learners to provide information rather than simply telling them something. Like many techniques, it has benefits and limitations. This means we need to keep certain things in mind when we want to use elicitation. It can be engaging for learners. You can’t elicit what learners don’t know. You must ensure that the language you use to elicit is well graded. You cannot use terms that are more difficult than the concept itself when defining/explaining it. How often should we review vocabulary? Very frequently, otherwise vocabulary books become “word cemeteries” – long lists buried and forgotten! Students are very tolerant of recycling and revisiting, more so than we tend to assume. It is useful to use the concept of expanding rehearsal: increase the gap between recycling each time. E.g. review after a week, then after two weeks, then after a month etc. There are many ways of reviewing vocabulary, but that’s for another post! Sinclair, J. M., & Renouf, A. (Eds.). (1988). A lexical syllabus for language learning. In R. Carter & M. McCarthy (Eds. ), Vocabulary and language teaching (pp. 140-158). Harlow: Longman. Wilkins, David A. (1972) Linguistics and Language Teaching. London: Edward Arnold.